IONA worked with Hoopers for over ten years. An independent department store chain with a strong fashion bias, it has four main stores and three menswear stores nationwide. We worked closely with the general managers, buyers and visual display managers throughout the year to drive footfall into stores and promote specific brands, products and departments. This 68 to 76 page fashion magazine is designed to foster the relationship that Hoopers has with its customers, and reinforce its brand positioning as the place to go for the latest high quality fashions. Ultimately, the magazine’s aim is to boost sales. We work hard to make it a cost-effective promotional tool by generating as much advertising revenue as possible. We also research and write editorial stories, including liaising with buyers and suppliers, and organise fashion shoots for womenswear, menswear, accessories and jewellery. We then design, print and distribute the magazine. This magazine promotes Christmas gift ideas, with a strong focus on driving footfall into stores to increase sales before and during the festive period. 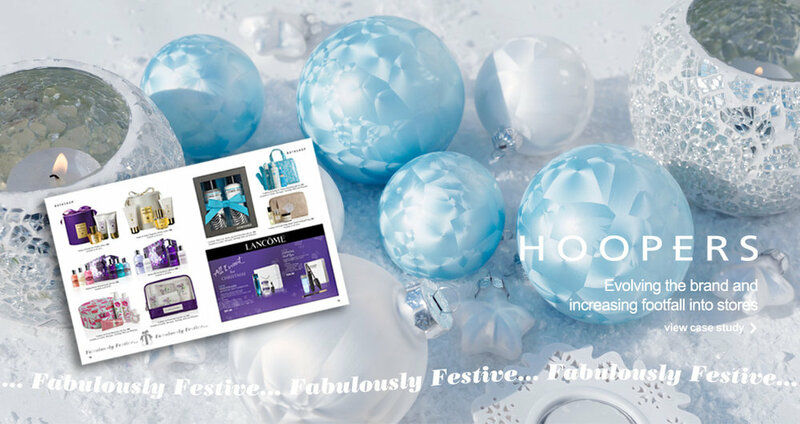 In addition to the magazines that we've produced for Hoopers, we've created various adverts and mailers throughout the year. All are carefully designed to meet clear objectives and follow through with in store hot spot branding. We also produce point of sale materials for all stores. We've planned and photographed model-based fashion photography, arranged castings and briefed models, liaising with visual display managers for props and accessories. Flat and stylised photography for fashion, menswear, jewellery and accessories takes place at our studio in Leeds. Contact: +44 (0) 7968 131866. IONA is a creative studio in the UK providing design, publishing, art and licensing services.